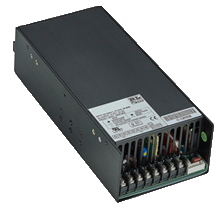 The PSRL5017R6 series provides up to 600 Watts of output power. All models have a single output and a universal input voltage range. Models are available in Enclosed with built-in Fan (Type E) designs. Output connectors are Howder terminal block design. Optional Mating Molex outputs are also available. Please contact factory for ordering details. Dimensions: 9.17in. × 4.25in. × 2.5in. Notes: (1) The PSRL5017R6 Series is designated as PSRL5017Rxw-yz where x=E (Enclosed with built-in fan type), w=6 for output power from 264W-500W, y= 03,05,12,16,36, or 48 for output voltage, and z can be blank or I where I denotes forced current sharing option (output with internal OR-ring diode). See PSRL5017R-I Series for forced current sharing. (2) All output ranges are covered in agency certifications and preset voltage will be set as standard models. If any request is not preset output, then please contact us in advance. (3) Ripple & Noise are measured from 10KHZ to 20 MHz bandwidth at output with parallel 0.1µF ceramic and 22µF electrolytic capacitors. (4) Providing peak power to 900W within 500µS for all models, longer duty duration need contact with manufacturer. (5) 1% minimum load is required to maintain the ripple and regulation. (6) Output is fully isolated.